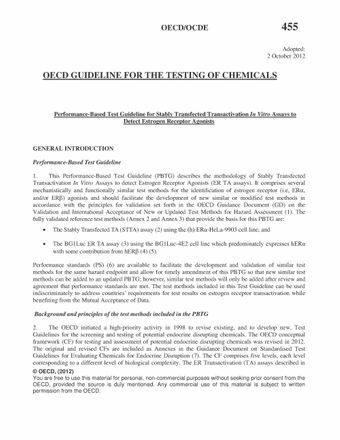 This Performance-Based Test Guideline (PBTG) describes in vitro assays, which provides the methodology of Stably Transfected Transactivation to detect Estrogen Receptor Agonists (ER TAs). It comprises mechanistically and functionally similar test methods for the identification of estrogen receptor agonists and should facilitate the development of new similar or modified test methods. The two reference test methods that provide the basis for this PBTG are: the Stably Transfected TA (STTA) assay using the (h) ERá-HeLa-9903 cell line, derived from a human cervical tumor, and the BG1Luc ER TA assay using the BG1Luc-4E2 cell line, derived from a human ovarian adenocarcinoma. The cell lines used in these assays express ER and have been stably transfected with an ER responsive luciferase reporter gene. The assays are used to identify chemicals that activate the ER following ligand binding, after which the receptor-ligand complex binds to specific DNA response elements and transactivates the reporter gene, resulting in increased cellular expression of a marker enzyme (e.g. luciferase in luciferase based systems). The enzyme then transforms the substrate to a bioluminescent product that can be quantitatively measured with a luminometer.These test methods are being proposed for screening and prioritisation purposes, but also provide mechanistic information that can be used in a weight of evidence approach.